There is a way to go back to Windows 8.1/8, 7, Vista or XP if you’re not happy with Windows 10. All the privacy issues surrounding Windows 10 may have you dissatisfied with your new operating system. While you can take steps to ensure the drivers to your system hardware, software and devices are compatible with Windows 10, you may still want to revert back to what’s comfortable and familiar — your old operating system. Whether you encounter a software failure on a manual or in-place upgrade to Windows 10, other software incompatibility or you just don’t want Microsoft tracking your every move, you can easily boot into the operating system you had installed prior to upgrading to Windows 10 — with your important files and applications in their most recent state (that’s their most recent state after running Windows 10 for a while — not their state at the time you upgraded — so you don’t lose any updates/edits to your data — yes, it’s possible!) but the catch is you must have taken this step prior to upgrading to Windows 10 in the first place. Download InstantRecovery and follow the instructions below. 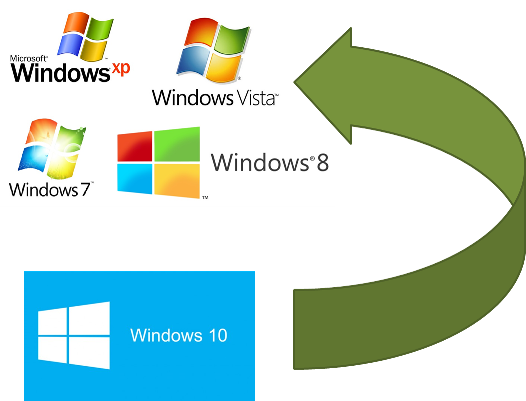 The majority of our customers are running Windows 7 (followed closely by Windows 8/8.1 and then Windows 10) but you can snapshot any Windows operating system, including XP and Vista, and revert back to that OS from Windows 10 using the same instructions. Be sure to follow InstantRecovery’s instructions to Data Anchor all the files you want available to you in your Secondary (Recovery) Snapshot if you ever revert back to Windows 7. You can specify certain folders to Data Anchor all the files in that folder – My Documents, My Pictures, My Downloads, My Music, My Videos, etc. – if you have important files saved to your Desktop you may want to include Desktop. (Do NOT anchor user, program or system files since a failure in one of these files would affect all your snapshots). InstantRecovery allows up to 5 snapshots in our Home Edition (and 10 snapshots in our Business Edition). If you want a simpler solution that will automatically Data Anchor the My Documents, My Pictures, My Music and My Videos folders for you, try InstantRescue instead. InstantRescue is a basic solution that gets the job done as well as InstantRecovery but it only allows one original snapshot (called the Original Area) and one recovery snapshot (called the Rescue Area) at a time. 2. Install and run Windows 10. 3. If you aren’t happy with Windows 10, the next time your restart your PC, hit F1 at the boot screen for InstantRecovery and boot into your Recovery Snapshot of Windows 7 to revert back to Windows 7 with all your important files and applications available in their most recent state. Have you upgraded to Windows 10 or do you prefer your older OS? Lauren, Thanks for the info. I’ll probably buy your Rescue and I may go ahead and try W10 to see how it screws up my system, knowing I can beam back up to the Entreprise safely. As long as one creates a Full drive backup before upgrading to Windows 10, no problem. Also, to prevent future issues when Windows support ends, be sure to backup the Windows 10 install before going back, they can’t say that a backup of the activated OS is not genuine. As long as the motherboard is the same, the OS should be good. Plus I’d not trust a clean install after a 5 year leave of absence. Chances are, fewer updates would be needed than one who has ran Windows 10 for 5 years. Little late. Why tell us this now when most people have already switched. You act like nobody has yet and it is simple to go back when and if they do. You need to check into the real world. Most of the techies will wait to see what the rest of the people respond with before making major changes like this…. Lauren, I have, after imaging Windows 7 7/8.1, yet when I did, made sure to image those also. 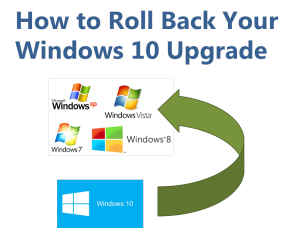 While a rollback will help revert the prior OS back, one can’t leave it to chance that in 2020, that they’ll be able to reinstall Windows 10 at no cost. That’s what (in addition to) the software offered here, a physical backup of Windows 10 before ‘going back’ preserves. There can be no denying that the Windows 10 install is genuine come 2020 with a licensed, activated, backup image. It’s like shutting the OS down & placing the computer in a closet for 4+ years, once the image is restored & is booted. May also save a ton of unnecessary upgrades (what we used to call Service Packs). My whole point being, both the current Windows install, as well as 10’s activation & licensing, needs to be preserved. I’m not questioning the software’s effectiveness at what it does, because I’ve been running Perfect Disk since 2009. It’s just not a two way streak, no option to flip the switch back to Windows 10 in January 2020, w/out a backup image, there’s no 100% guarantee that one won’t have to pay for Windows 10.